Social media is seemingly saturated with beautiful and awe-inspiring photos. Nowadays, it has become normal to see countless, gorgeous shots of far-flung destinations. While aerial shots taken with personal drones are common sights, underwater images are still relatively rare and the dramatic results make strong visual impacts. If you want to take your travel photography to another level in a very unique way, consider exploring the underwater world. Thanks to the advancement and affordability of camera technologies, it’s easier than ever to create amazing underwater photos. The types of images you can create depend on your gear, visibility and light conditions, as well as your own abilities. Here are some tips for shooting underwater. You’re going to need a hardy waterproof housing you can trust for your action cam, cellphone, point-and-shoot, mirrorless camera, or full-blown DSL. Do your research, read real reviews, and get a tried and tested model. As soon as you get one, submerge it without your camera inside to check for any leaks or defects. If you plan to take photos on a diving trip, you may rely on your dive light or consider acquiring an external underwater flash. You’ll want to try out your new underwater photography system, before bringing it out on the field, in order to prevent costly mistakes due to inexperience. Find a pool to take your underwater camera for a test drive. Waterproof camera housings can be attached to your person or mounted on your gear (like your mask). Practice submerging yourself then detaching and handling the camera. Also, practice staying level long enough to take a photo, and reattaching the camera to yourself so you can swim freely. Consider a wrist strap for a smaller action cam or cellphone. You don’t want to drop your device by accident. Photography, at the end of the day, is all about painting with light. Sunny days afford sufficient light near the surface. The deeper you go, the harder it will be to expose a photo and clearly depict a subject. 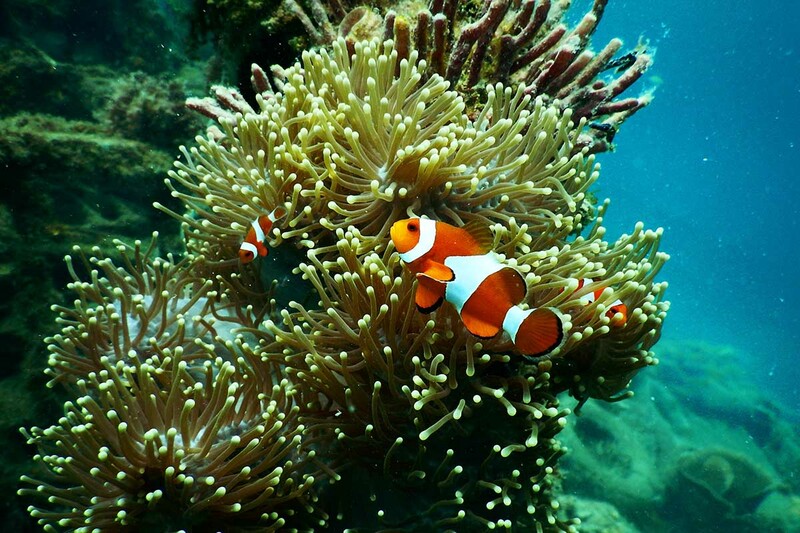 Even if you’re snorkeling in very shallow waters, cloudy conditions will dull the colors of creatures and corals. If you’re planning to shoot marine wildlife, color is key. Your internal flash will suffice for subjects that are only a couple of feet away. Take along an external flash for more professional results. Consider setting your manual white balance when taking photos without flash. If you don’t want to spend a ton of money on fancy gear, do get some filters in warm hues. You can buy red, magenta, and yellow filters for your action cam, cellphone, or camera. These convenient underwater filters can really help bring out the natural colors of marine life, which would otherwise be washed out in the seawater’s blues and greens. Don’t forget your basics in composition and exposure while you’re shooting underwater. People can be great subjects because they immediately provide a sense of scale. The beautiful, athletic silhouette of a human body braving the depths can be inspiring and otherworldly, while sunlight playing near the surface can have a cheerful, relaxing effect. Experiment with framing and distance for maximum impact. The wider your lens, the more you can fit into a shot. Remember to incorporate coral reefs, geological formations, wrecks, and landscapes into your photography. Certain underwater features will make photographs look alien and ethereal. When photographing wildlife, try to get within three to four feet of your subject. Avoid excessive eye contact, fast and sudden movements, physical interference, and harassment. When a marine creature is moving, try to swim alongside it rather than aggressively chase it. While flash may not permanently blind an animal, don’t dial yours up to maximum brightness. Steer clear of behavior that could be considered harmful, irresponsible, or worse. You don’t need expensive gear or professional experience to take impressive underwater photos. Always remember that safety is your utmost priority. Do not allow your gear to interfere with the well-being of your companions, your environment, and yourself. Keep your equipment dry, secure, and non-obstructive. Have fun exploring the fantastic world of underwater photography and its infinite possibilities!